It’s officially construction season. Not just road construction, but fiber construction! And if you are doing any of your own excavations in yards, fencing projects or any other digging, PLEASE make sure to Call 811 at least two (2) full BUSINESS days before you dig. You don’t want to be the one who cuts off your neighbor’s Internet connection (or the whole town’s) because you didn’t call 811! Here’s a guide to what all those flag colors mean when you call in a locate. The more fiber we get in the ground, the more critical it becomes that all excavators call 811. 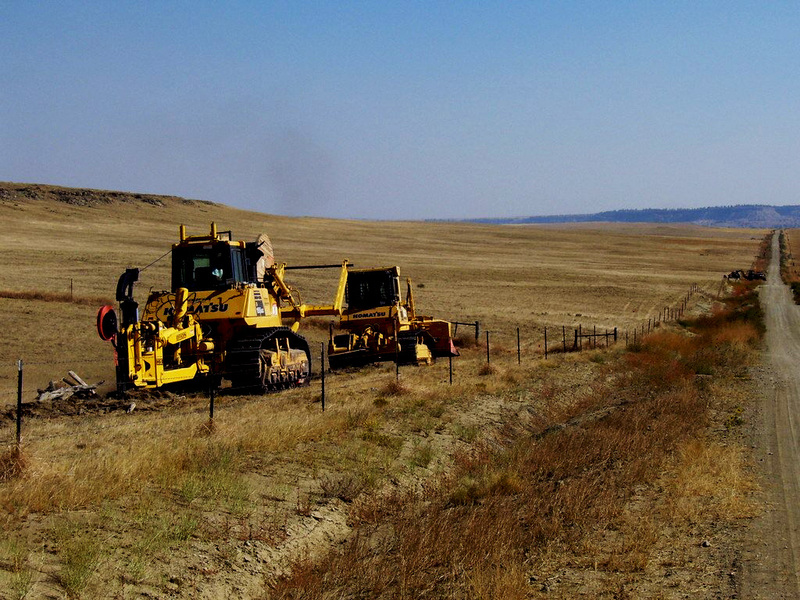 The State of Montana now has penalties and fines for excavators who don’t. Custer – Entire Exchange (856). Includes approximately 220 subscribers and just over 100 miles of construction. Contractor MP Nexlevel will begin on this project after completing final 2017 project cleanup in Fallon, Ekalaka, Plevna and Baker. Lavina – Entire Exchange (636). Contractor Anderson Underground will be working on this project, building just shy of 100 miles of fiber to about 295 subscribers. Lindsay (584) – Town & Some Rural Areas. The Mid-Rivers construction crew has begun work south of the town of Lindsay. This project includes about 50 subscribers and just under 70 miles of construction. Bloomfield – Entire Exchange (583). Mid-Rivers crews will also work on this project, building about 55 miles of fiber to 35 subscribers. Musselshell (947) – Town & Some Rural Areas. MP Nexlevel will move to this project after completing Custer. It will include about 130 locations and 78 miles of construction. Melstone (358) – Town & Some Rural Areas. This will also be done by MP Nexlevel and includes about 150 locations and 64 miles of construction. Ryegate – Entire Exchange (568). Anderson Underground will build to 35 subscribers with 48 miles of fiber. Grass Range (428) – Town & Some Rural Areas. This will also be handled by Anderson Underground and includes about 200 locations and 92 miles. Roy (464) – Town & Some Rural Areas. Anderson Underground also has this one, which will cover about 125 subscribers and require 70 miles of construction. Savage – Remainder of Exchange (776). The town of Savage was built last year; this project will construct to all remaining locations in the rural areas of the Savage exchange. MP Nexlevel is scheduled for this one, which will get to 60 subscribers with 32 miles of fiber construction. Our 2018 and 2019 construction will be the last to include any towns – everything left after that is strictly rural. If you are wondering where you are at on the schedule, make sure to give us a call or email and we’ll get you a date! While getting these projects done is as much (or more) about time and resources as it is about money, we were recently fortunate to be offered some additional Federal funding for rural broadband construction through the Alternative Connect America Model (A-CAM) program. The Federal Communications Commission (FCC) has allocated another $500 Million in support (from Universal Service Fund (USF) reserves) for the nation’s smallest broadband providers (known as the “Rate of Return” carriers). The largest portion of that – $360 Million – was directed toward carriers like Mid-Rivers who have elected the A-CAM support model. We have very specific broadband build-out requirements to meet by 2020, with annual milestone requirements thereafter through 2026. In total the A-CAM program is expected to fund about half of the anticipated cost of building fiber to our required locations, but our plans include getting to more than just what is required. Every business decision we make is done so with the long-term goal of getting broadband to ALL members in mind. I hope to see some of you tomorrow at the Annual Meeting of the Members in Roundup! Registration begins at 10AM with the business meeting to follow at 11AM. We know your time is valuable, so we plan to stick to business and keep it short and sweet this year!